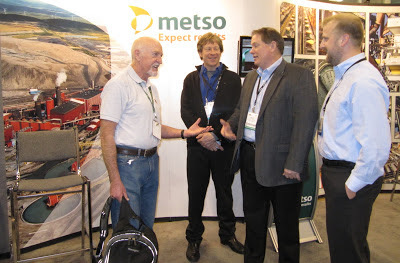 It is 14 years since I was last in Salt Lake City for an SME Annual Meeting, and as with all the SMEs that I attend, this is essentially a personal pictorial diary of my two days spent at the event, mainly in the huge exhibition, always a good place to catch up with old friends and meet new ones. High resolution images can be accessed and downloaded by clicking on any photo. This is in no way a report of the convention. I doubt if any single person could do that, as, as always, there was a formidable programme of technical presentations, in a huge array of parallel sessions, so if you attended the event I invite you to leave your own personal views and experiences. The Convention got underway this afternoon with the opening reception for the exhibition. This is always a good time to view the booths, as the exhibitors are at their most attentive at this time, before the inevitable listlessness sets in later in the week. Due to my activities in the Wasatch Mountains, I missed last night's International Mining Hall of Fame dinner, but I caught up with the International Mining team this afternoon. John Chadwick still holds the statuettes for the two mineral processors inaugurated into the Hall of Fame, Australia's Prof. Graeme Jameson and Prof. Alban Lynch, neither of whom could attend last night. Although there are various mining halls of fame around the world, John Chadwick established the International Mining Technology Hall of Fame because there is not one specifically for the technology innovators of our industry, and there have been many very important innovations/technology developments that have massively changed the industry in terms of productivity and safety. It is also the first truly International Hall of Fame in the industry - the first inductions include Americans, Australians, South Africans, Finns, Swedes and Canadians. Hopefully the International Technology Mining Hall of Fame will get better known and we can revel in greater numbers of nominations each year. 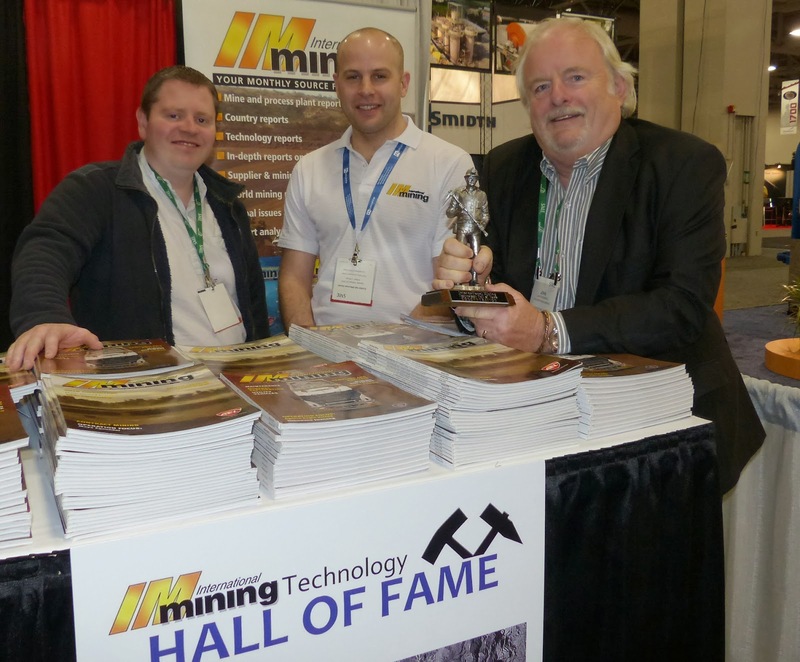 John Chadwick is pictured below, holding a Hall of Fame statuette, with Paul Moore and Phil Playle of International Mining. 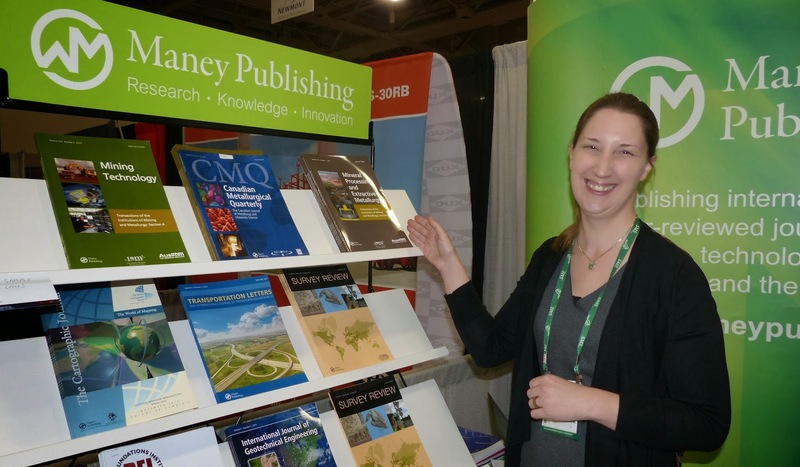 There were two other London-based magazine publishers at the meeting, and it was good to meet Emma Leighton, Managing Editor of Maney Publishing, who, amongst others, publishes Transaction of the IMM and Canadian Metallurgical Quarterly. 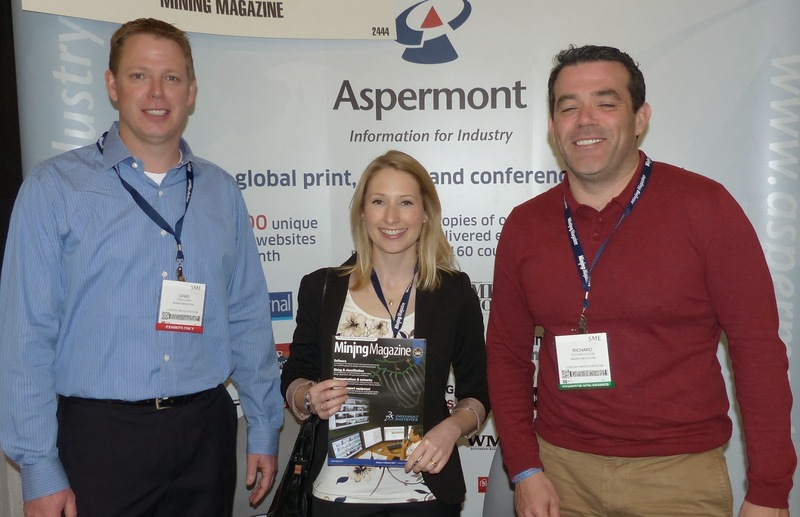 I also met for the first time Carly Leonida, the Editor of Mining Magazine. As always the exhibition does not open until 11am, so I took a look in the SME bookstore. 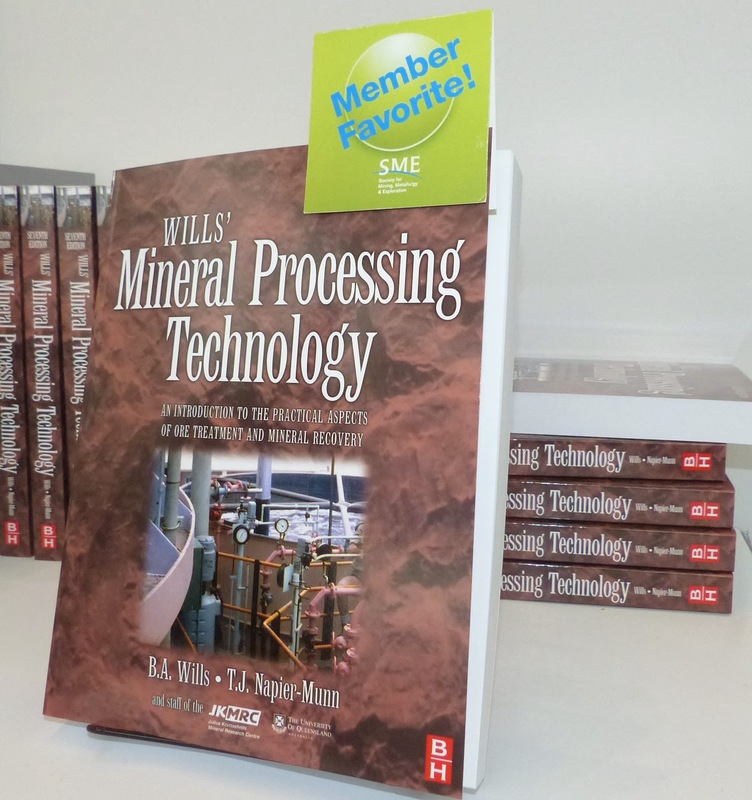 The only new mineral processing book was Mineral Processing and Extractive Metallurgy, but I was pleased to see that Mineral Processing Technology is still a member favourite. Outside the bookstore I met up with Jim Finch of McGill University, newly appointed MEI Consultant to Flotation '15, Jan Laskowski of University of British Columbia, and the organisers of this year's International Mineral Processing Congress in Santiago, Juan Yianatos of Santa Maria University, and Romke Kuyvenhoven of Gecamin. All is looking good for the IMPC, with over 800 abstracts currently being reviewed, and an attendance of around 1000 delegates expected. Major sponsors are Outotec and Antofagasta, and site visits to local operations will take place on the Friday following the congress. MEI isn't the only small Cornish company represented at the SME. It was a very pleasant surprise to see my old Camborne School of Mines student Chris Bailey, with his son Adam Bailey, representing the Redruth company Holman-Wilfley, the world's leading manufacturer of shaking tables. 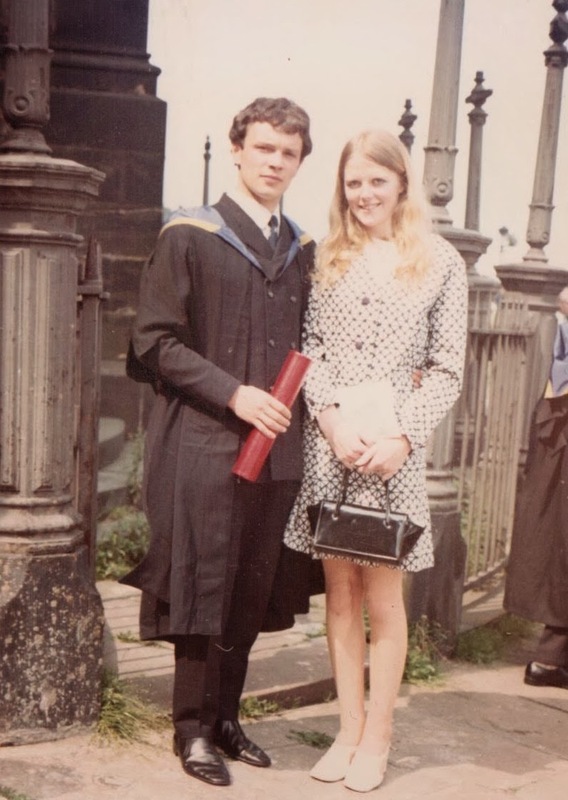 Chris graduated from CSM in 1976 and is now Managing Director of the company. Adam, a mechanical engineer, has worked with Chris for the past few years as Production Manager, and will be starting an MSc in minerals engineering at CSM later in the year. 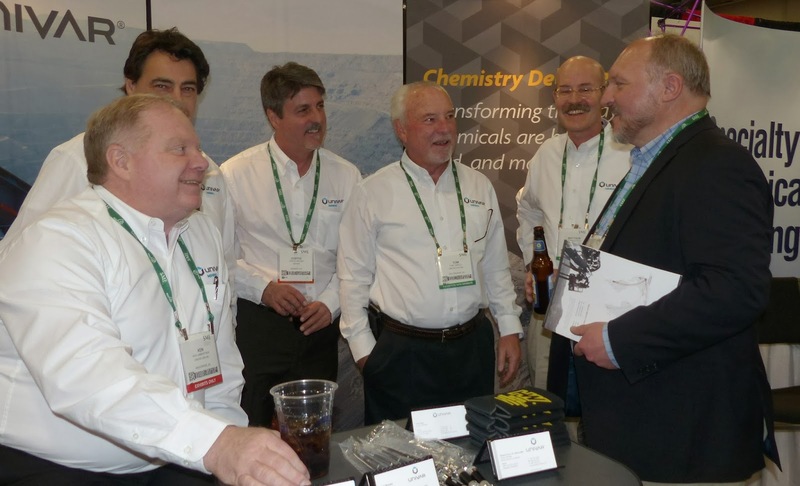 Third from the left in the photo below is another of my old students, Dave Meadows, who graduated in 1985 and is now Vice President of Global Process Technology with FLSmidth, whose headquarters is in Salt Lake City. 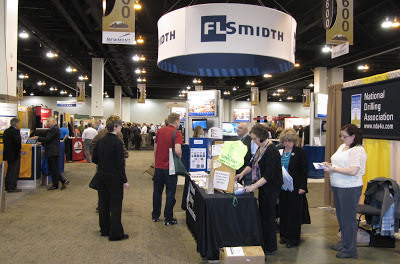 FLSmidth is a serial sponsor of MEI Conferences, and their booth is always a landmark at SME events. 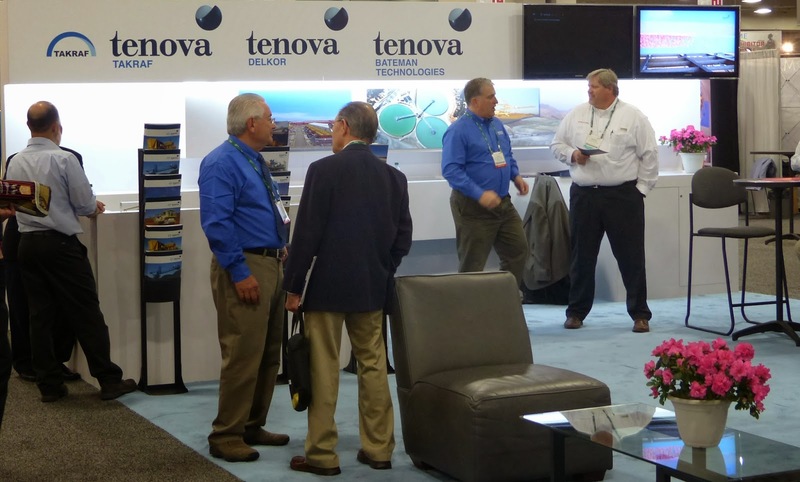 Their giant display was always busy, reflecting the interest in their services, and some of their many staff manning the booth are photographed below. 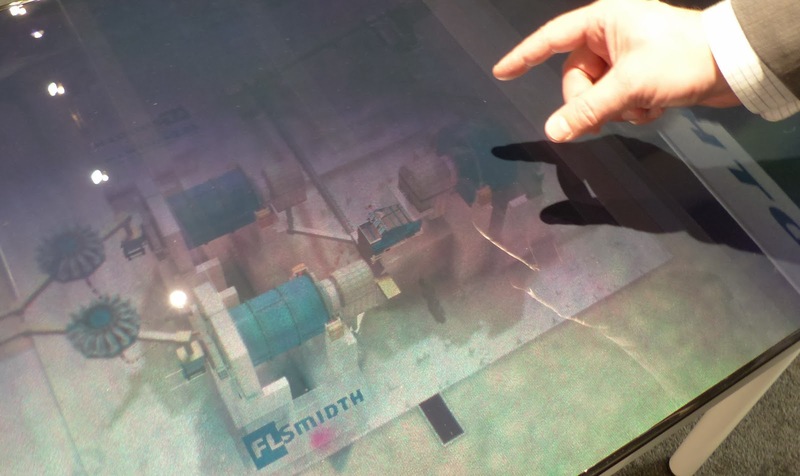 One of the features of their display was a series of holograms (see left) of mineral processing operations, a first, I think, but probably the future of marketing display. 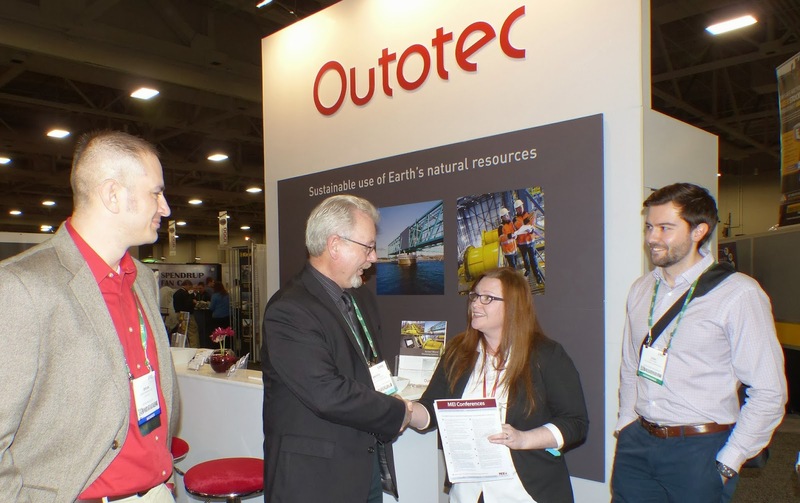 Outotec is also one of our regular sponsors and they too had a large display in their busy booth. 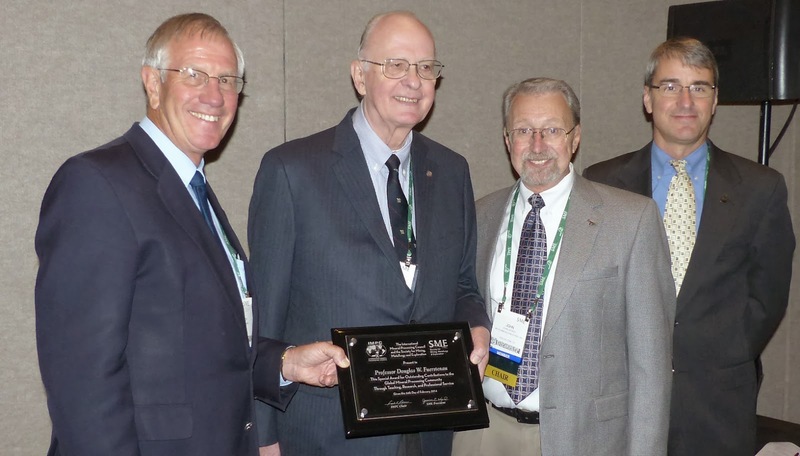 The highlight of the afternoon's opening Mineral Processing Division session was the SME/IMPC presentation of a special award to one of the world's most eminent mineral processors, Prof. Doug Fuerstenau (see MEI Online), tribute being paid by Cyril O'Connor, Chairman of the IMPC and John Marsden, new SME President. In the photo below, Prof. Fuerstenau is pictured with Cyril O'Connor, John Herbst (USA representative on the IMPC) and John Marsden. The award ceremony was followed by the Antoine Gaudin Memorial Lecture "From Dreams to Reality: Modeling of Mineral Processing Dynamic Performance Management", given by Osvaldo Bascur of OSISoft LLC, USA. This in turn was followed by the Richards Lecture, "It takes a village to raise a metallurgist" by John Mansanti, Intrepid Potash, USA and finally the Wadsworth Lecture by Gary Kordosky, USA, "Asking Key Questions to Speed SX Reagent Development". The recipients are shown below, with their awards. Back at the exhibition it was nice to catch up with my old friend Steve Hearn, of Huntsman, manufacturers of flotation and hydrometallurgy chemicals. 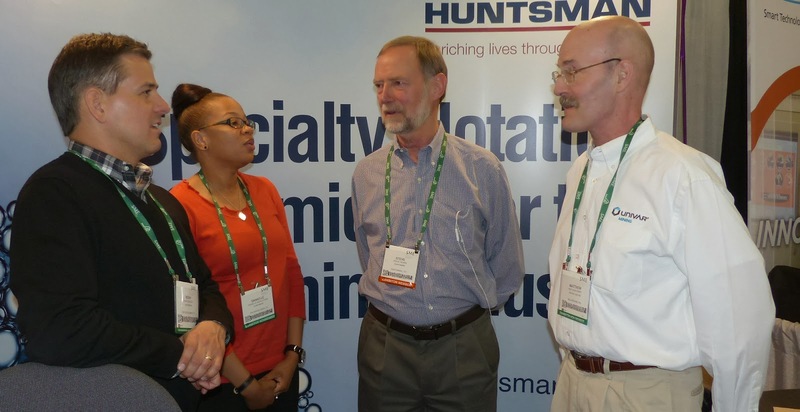 He is pictured 3rd left below with Noah Denson and Danielle McGlothen of Huntsman and Matthew Parry of Univar, who also manufacture mining chemicals. 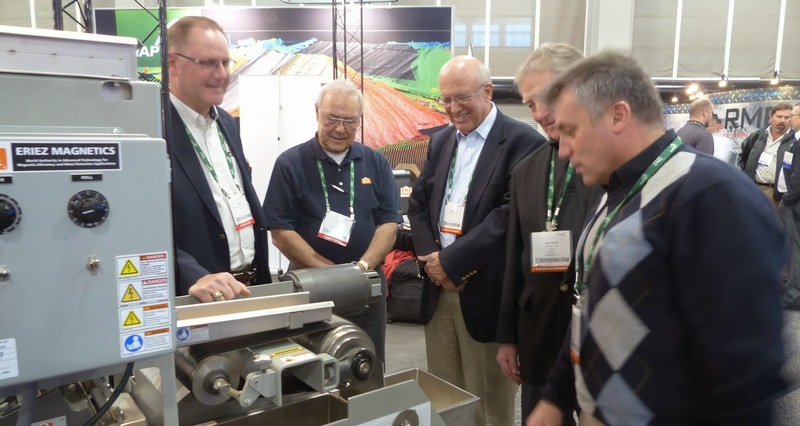 In the adjoining Univar booth, was Peter Radziszewski, of Metso, Canada, who will be presenting papers at Comminution '14 in a few weeks' time. Leaving the booth I met Univar Vice President of Global Mining Sam Sutherland (right) with Mike Roberts and Dennis Kennedy of Georgia-Pacific Chemicals. 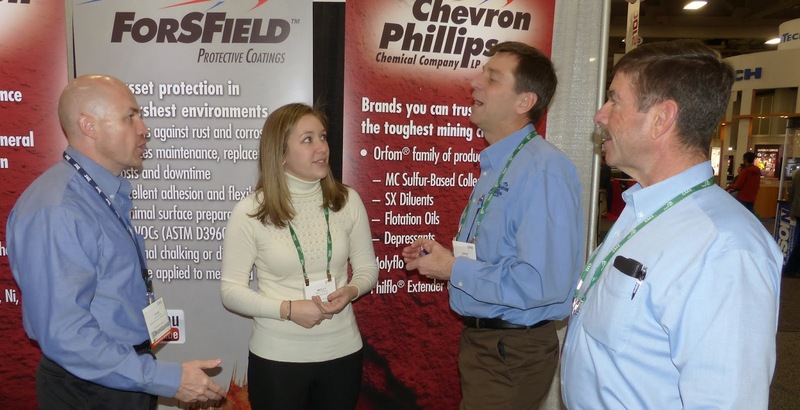 I then called in at another mining chemicals company, Chevron Phillips, where representatives were discussing flotation and hydromet chemicals with Molly Bragg of Flowrox. 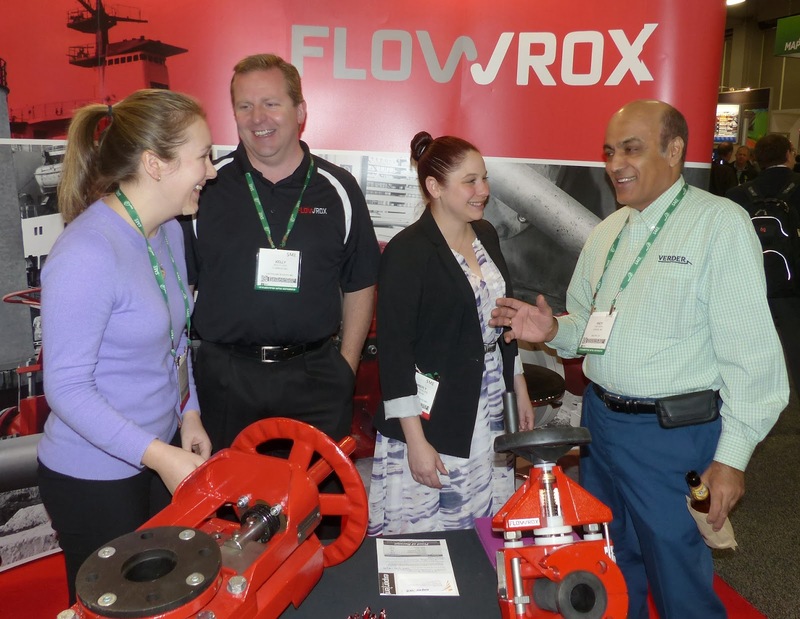 I caught up with other Flowrox representatives later, talking to Andy Deva, of Verder. 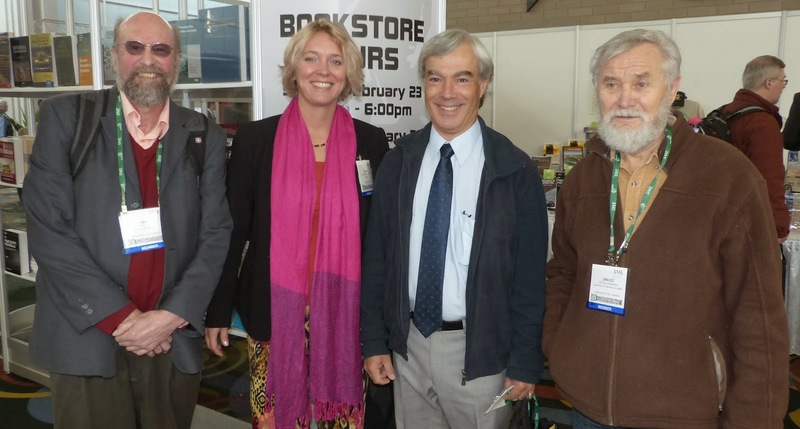 As last year there is a Symposium on Water in Mining with keynotes in the late afternoon, and, as last year one of the keynotes was presented by Rob Dunne, one of the co-editors of the Mineral Processing and Extractive Metallurgy book launched this week. Rob again provided an excellent overview of water in the wider global arena and compared this to how the mining industry has dealt with water stewardship over the last couple of decades. He discussed progress made to decrease water usage, increase recycle water and the installation of the new mega size multibillion dollar reverse osmosis desalination plants around the world. The SME inform me that 539 companies are represented in over 800 booths, a record, although there are fewer delegates registered, almost 6000, compared with last year in Denver. I long ago decided that, due to the bewildering array of parallel sessions, I would give the SME technical sessions a wide berth, but this morning was the start of the Douglas Fuerstenau tribute symposium on fundamentals and applied advances in mineral processing. This bizarrely ran in parallel with sessions on comminution, leaching, non-sulphide flotation, separation, tailings, and water quality. I called in at the Fuerstenau symposium to hear IMPC Chairman Prof. Cyril O'Connor review how in recent years the Centre for Minerals Research at the University of Cape Town has been integrating its comminution and flotation research, the presentation reviewing this work and demonstrating the importance of developing a fully integrated approach to the design and operation of comminution and flotation circuits. This is good to see, as in recent years minerals engineers have become increasingly narrow and specialised, and there is a decreasing number of people around who can see the wide picture. 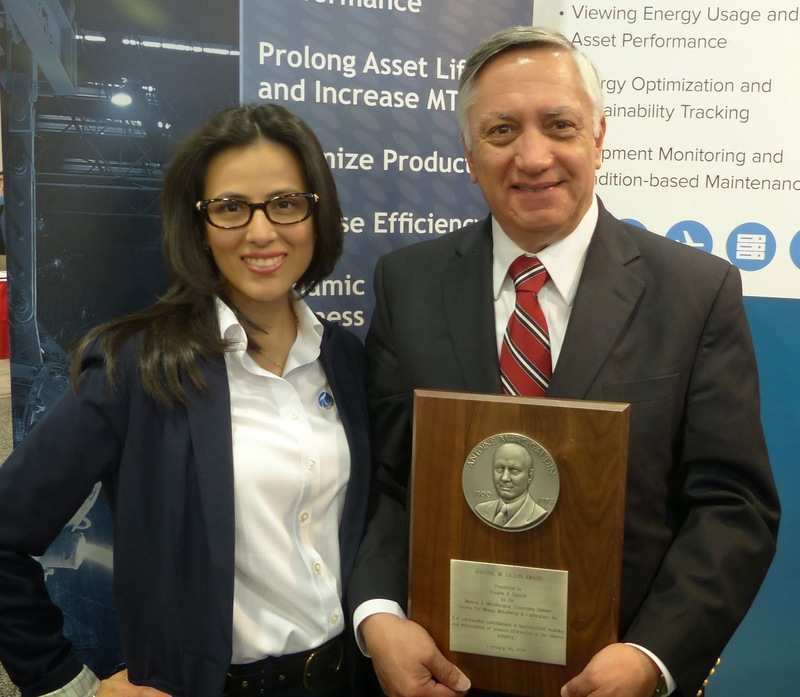 Back at the exhibition I called at the OSIsoft booth to congratulate Osvaldo Bascur on his award yesterday of the prestigious of 2013 Antoine M. Gaudin Award (see also MEI Online), the selection acknowledging Dr. Bascur's outstanding contributions in mathematical modelling and management of process information in the mineral processing industry. 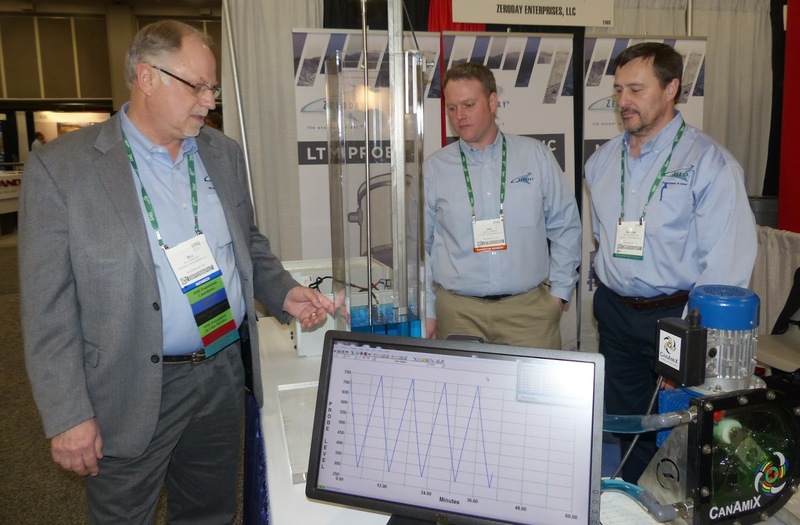 I reported last year on Zeroday Enterprises' flotation bank pulp level control probe, and was updated today on how it has evolved over the past year by Senior Project Engineer Bill Stockton. Eriez is best known for its range of magnetic separators, but the company also manufacture column flotation machines and the coarse particle flotation Hydrofloat Cell. I first saw the latter at Metplant '13 and persuaded the flotation division to present a paper on its potential applications at Flotation '13 (posting of 5 August 2013). This device has great potential for reducing energy consumption, by recovering values at a coarse size within grinding circuits. I was particularly interested in their rare earth magnet roll separator, which was on display separating ilmenite from quartz. The powerful permanent magnet in the roll operates at 2T, testament to the strength of boron-neodymium alloy magnets. More bewildering clashes after lunch, with the Fuerstenau symposium running in parallel with sessions on flotation, plant design, and research and characterisation. Kal Sastry, of University of California at Berkeley, presented an interesting overview of the past, present and future of mineral process engineering, showing its evolution through the early and later parts of the 20th century to the present times, highlighting the contributions made by Doug Fuerstenau and his students and grand students. He discussed research needs and the exciting opportunities provided by mineral process engineering as a result of the rapidly evolving technological changes of this century. And then back for my last walk around the exhibition. 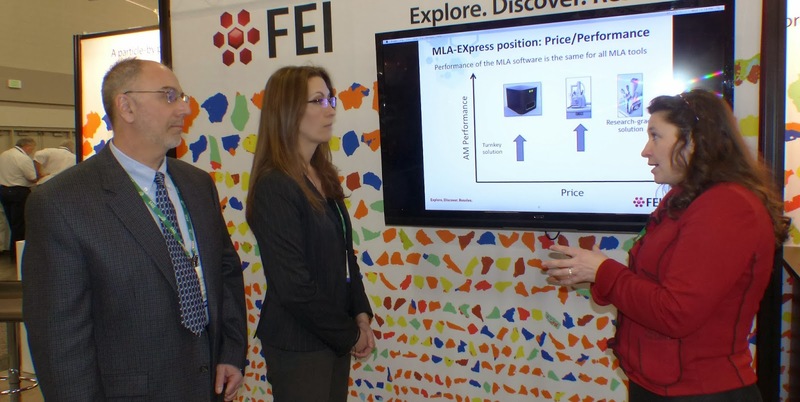 FEI is a sponsor of Process Mineralogy '14, and is a world leader in automated mineralogy systems. Ore mineralogy and texture are primary variables controlling base and precious metal recoveries, yet 99% of mineral processing plants operate blind from a mineralogical perspective, with access only to a snapshot of recovery performance by mineral species, grind size and liberation, based on occasional monthly composite sample analysis carried out in central technology laboratories or at service providers. Peter Dimas and Jaquelin Nerrera, of Nalco, were following with great interest FEI's Anna Shestakova's summary of how development is ongoing to enable the generation of daily automated mineralogy data (QEMSCAN or MLA) on-site, with a turn-around time of around 24 hours. Christian O'Keefe of CiDRA Minerals Processing Inc. was demonstrating the company's new CYCLONEtracSM Classification Optimization family of products, which are novel, complete turn-key systems that enable reliable optimization of classification at the individual hydrocyclone level, providing reliable, real-time coarse particle monitoring and particle size tracking on individual hydrocylones. 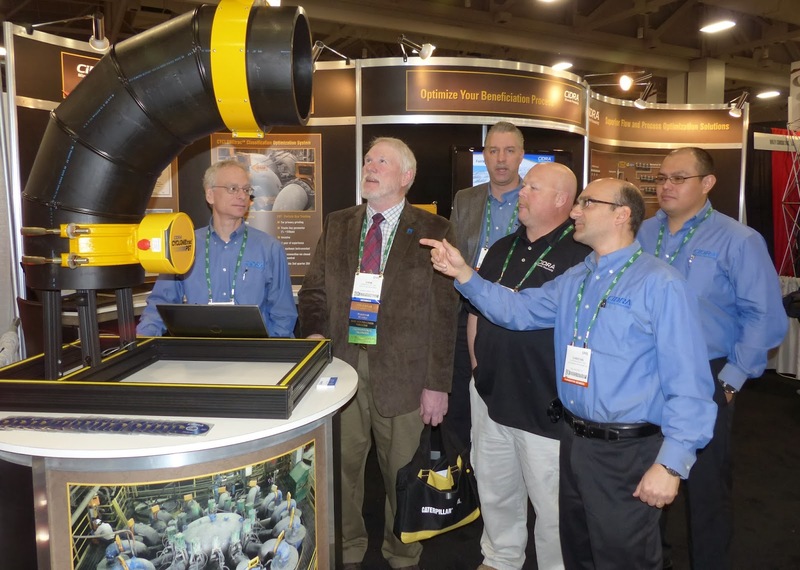 These systems enable plant operators to reduce process upsets, improve closed circuit grind and classification, and maximize mineral recovery. The system is based on a non-invasive clamp-on sensing ring designed for use in primary grinding. The system monitors the flow of coarse particles >6mm (pebbles) reporting to the overflow pipes of individual hydrocyclones, which indicates poor classification performance. The value of this technology lies in enabling operators, or automated control systems, to take immediate action to avoid prolonged periods of lower recovery through the early detection and isolation of pebble events. I am hoping that CiDRA will be able to showcase this at Comminution '14. 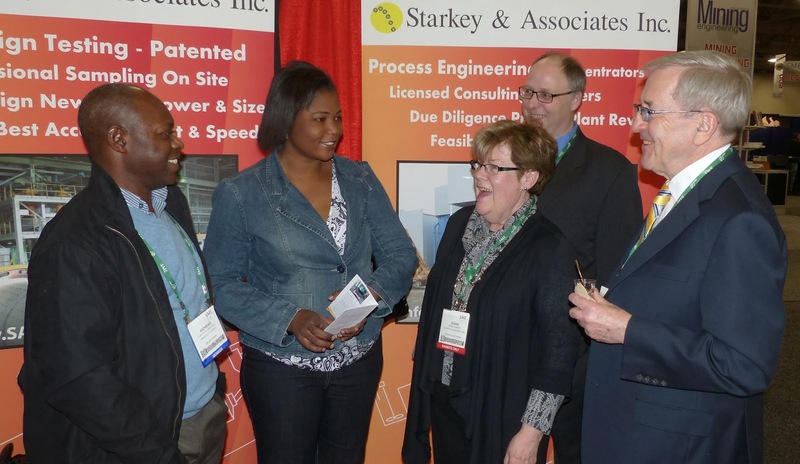 I called in at Starkey & Associates, who are also sponsors of Comminution '14, and will be exhibiting at the event. 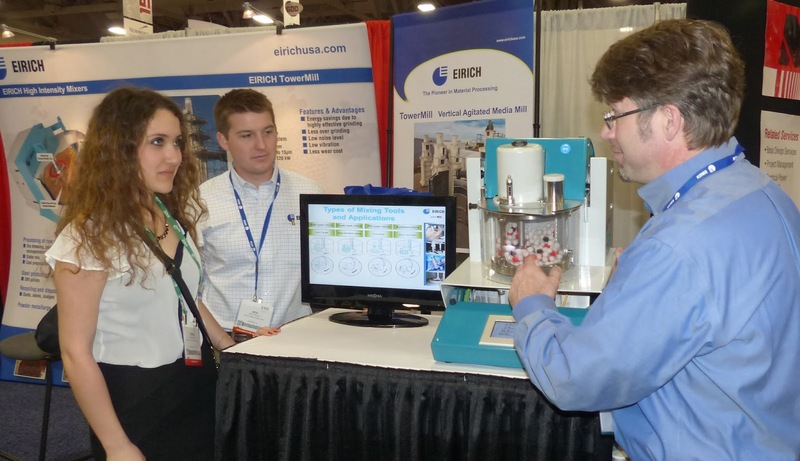 German company Eirich is another sponsor of Comminution '14 and one of their key areas is ultrafine grinding, which interested Ceren Bozbay of South Dakota School of Mines, who is talking to Eirich's Ben Stroup and Peter Wulff. 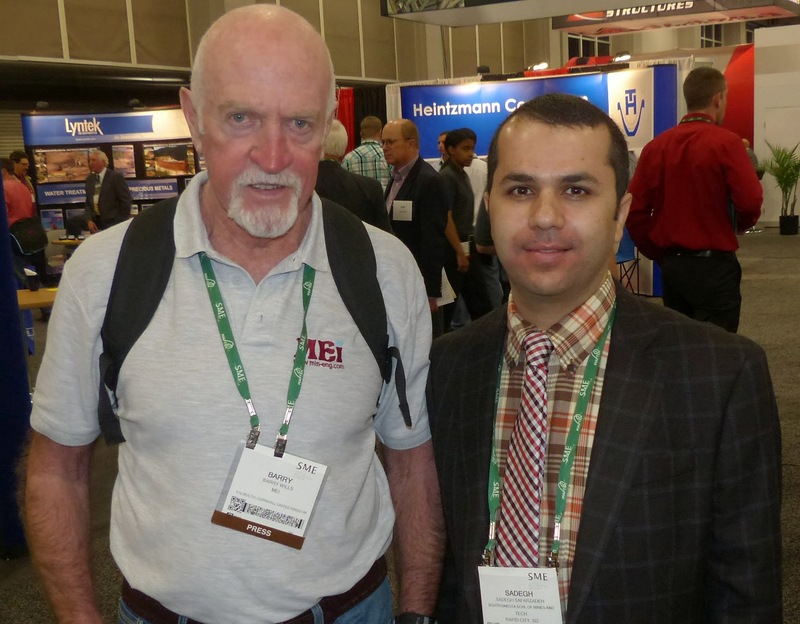 Also from South Dakota School of Mines is Sadegh Safarzadeh, who I was pleased to meet, as he is a fellow Elsevier journal editor, his role being an Associate Editor of Hydrometallurgy. Once again the SME has proven to be a great networking event and I have had a rewarding two days wandering around and catching up with people. 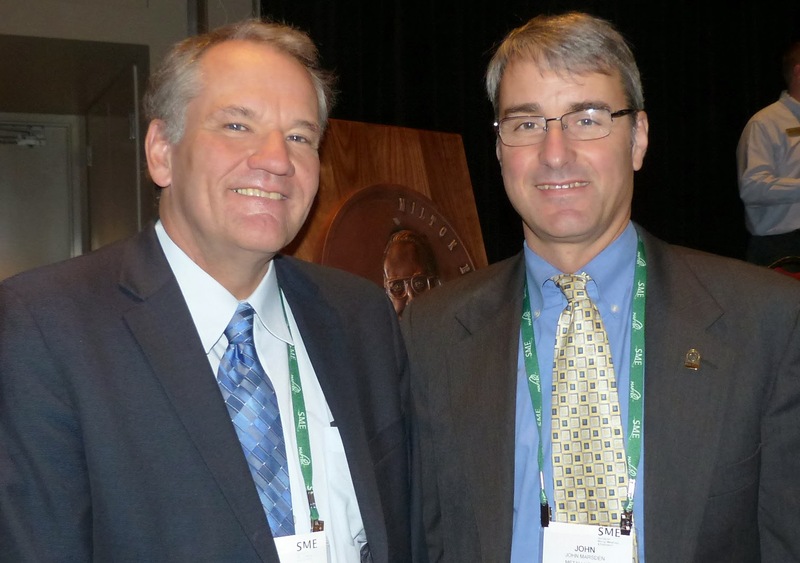 As I have an early morning flight tomorrow I will miss the Mineral Processing Division lunch this year, but wish John Uhrie all the best in his year as MPD Chairman, which he takes over from Corby Anderson of Colorado School of Mines. Corby is pictured below with incoming SME President John Marsden. I look forward to next year's event, which will be held in my favourite SME venue, Denver, from February 15-18. A new book was launched at this week's SME Meeting in Salt Lake City. Mineral Processing and Extractive Metallurgy, 100 years of innovation, edited by C.G. Anderson, R.C. Dunne and J.L. Uhrie, presents more than a century of innovation drivers that have advanced the mineral processing industry. Trends, developments, and improvements are discussed in depth, and likely areas for future innovations are explored. This proceedings from the successful 2013 SME symposium features more than 75 subject-matter experts. 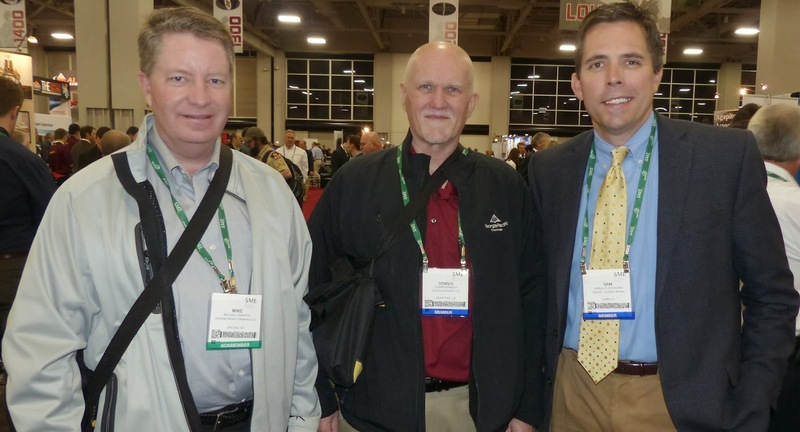 These authors share their knowledge, experience, and passion for the metallurgical industry. The book is available from the SME. The SME Annual Meeting opens this afternoon in Salt Lake City, and I am shortly off to the Convention Centre to register. 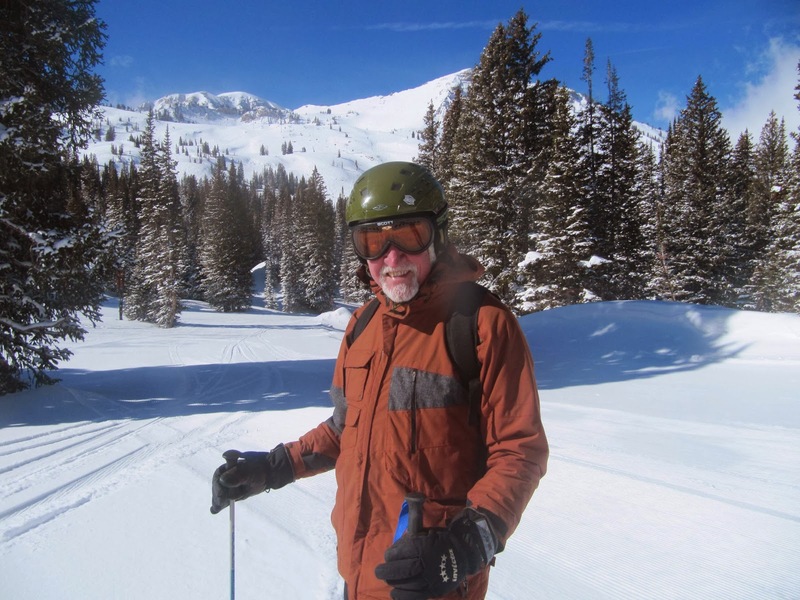 I arrived on Wednesday evening and have spent the last 3 days warming up for the event in the Wasatch Mountains, the western edge of the Rocky Mountains. 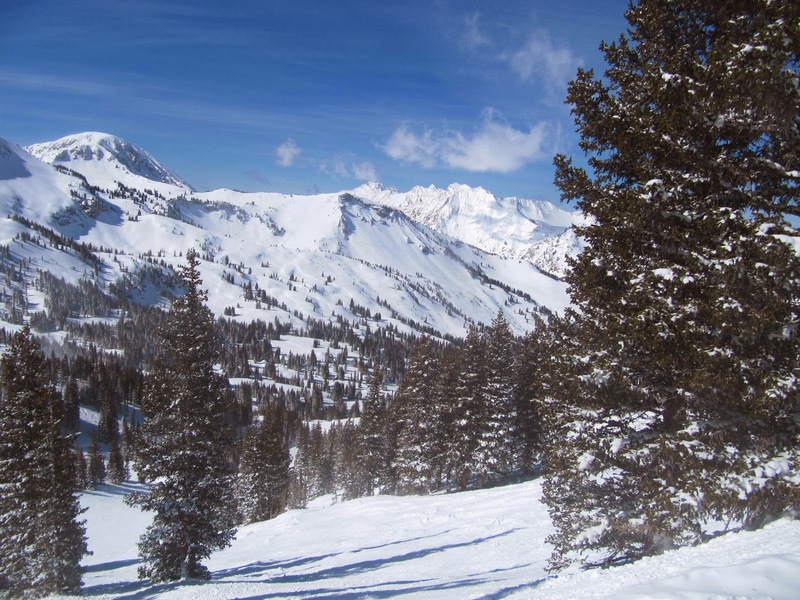 My three days were in Alta, a great ski area just over an hour by bus from downtown Salt Lake City. I will be at the SME for two days, meeting and photographing people, mainly in the exhibition area, and hope to post daily updates on Twitter (@barrywills and #SME2014AM). My notes and photos will be on the blog next weekend. Look forward to seeing some of you in the next few days. 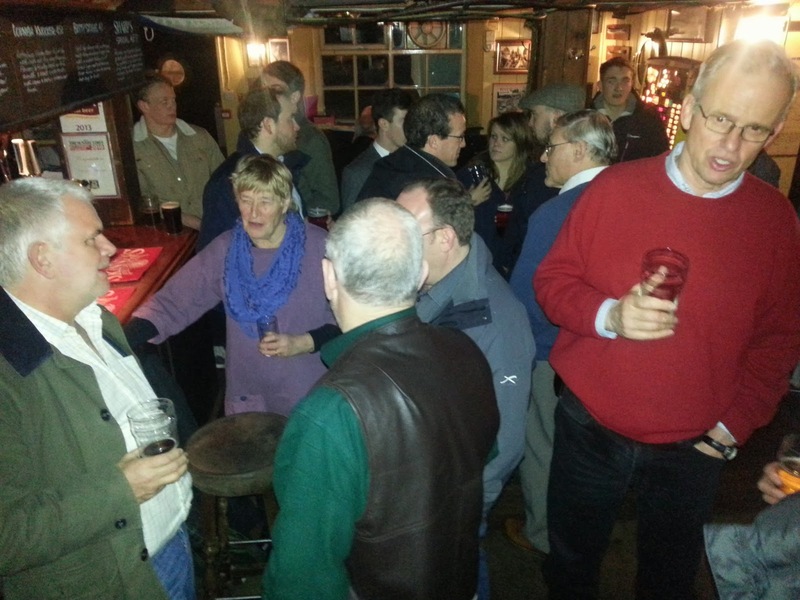 This was my first foray out to the Cornwall Sundowner and apparently I picked one of the busiest. There were a lot of students this month, due to the annual Bottle Match being played this weekend. The Bottle Match is a rugby match played between students of the Camborne School of Mines and students of the Royal School of Mines (RSM). It first first staged in 1902, and since then hockey, football, golf, netball and squash have also been introduced to the competition, however the deciding match is still the rugby match. Good luck to CSM (not that I'm biased! ), who will be fighting hard to regain the cup after losing to RSM for the last 3 years! As well as bumping into my brother, Jon Wills, there, I also had a chat with Nick Wilshaw, who is looking forward to attending Comminution '14 in a few weeks time in Cape Town. Nick's company, Grinding Solutions are sponsors and exhibitors and Nick, Jon and I discussed the problems of finding a 'give away' that people actually want and use. Any ideas anyone? Al Cropp of MinAssist was also there. I hadn't seen Al for a good few years, since which we have both started a family, so it was good to catch up and swap stories of parenthood. I'm sorry that I didn't get to chat to many others, but will hopefully be a more regular attendee in the future! I am in the BA lounge at Heathrow's Terminal 5, en route to Utah for a few days skiing prior to the SME Annual Meeting. which opens on Sunday in Salt Lake City. As MEI is a media partner, I will be reporting on the event in words and pictures, so if you are attending and have any interesting mineral processing news, please try to contact me in advance. Internet permitting I will also be regularly updating news of the event on Twitter @barrywills and #SME2014AM. Last year's report from Denver can be seen here. Everyone who has lived and worked in Africa has wonderful tales of adventure to tell over the dinner table. My dinner party story is of an eventful six days in Tanzania, 43 years ago. But our tale pales into insignificance compared with that of our friends and neighbours in Chingola, Ross and Sara Dunn. 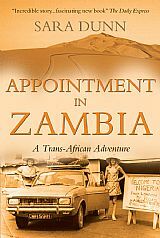 Sara has just published an account of their epic journey to Zambia, in a fascinating book Appointment in Zambia. In 1970 newly-weds Ross (23) and Sara (21) set off, with extraordinary naivety and a lack of proper preparation, to drive from Edinburgh to Zambia in a standard Hillman Hunter saloon car. For eight weeks, in a journey of over 20,000 kms, they slept in the car and coped with illness, and almost insurmountable obstacles, their only technology being the car and a compass. Their journey took them across the Sahara Desert, where they dug themselves out of trouble with Tupperware containers (they were carrying their household utensils in the back of the car! ), war-torn Biafra, equatorial forests and a crossing of the main tributary of the Congo River on a make-shift raft. The journey took them across 13 countries with different customs, currencies and languages before they reached Chingola in time for Ross to start his first job as a mechanical engineer on the Nchanga Mine. Not since reading Blood River, an account of a remarkable journey down the Congo River, have I been so entralled by a tale of adventure, and I would recommend the book to anyone who can empathise with the Dunns' feelings of remoteness and vulnerability in the vastness of Africa. Ross and Sara finally arrived in Chingola in December 1970, and lived opposite Barbara and me. We became friends mainly due to sport- Ross and I played squash and he was for a time captain of Nchanga Rugby team, and did some training with me at the weight-lifting club. Ross and Sara left Chingola for London (this time by Union Castle boat!) in 1972; Ross had persuaded the mine to sponsor him to convert to a mining qualification at the Royal School of Mines. They returned to Chingola in August 1974 for 3 years until 1977, where Ross progressed from Mine Captain to acting Open Pit Manager. They finally left Zambia in 1977 and the last ime we saw them was in 1978, when they stayed with us in Falmouth for the 'Bottle Match' the passionately-fought annual rugby match between RSM and CSM. Ross was then lecturing at RSM, but soon afterwards was employed by Blue Circle Cement until he took early retirement in 1999, after which he set up Incahoots Ltd, a consultancy for businesses looking for a 'Partnership' approach. 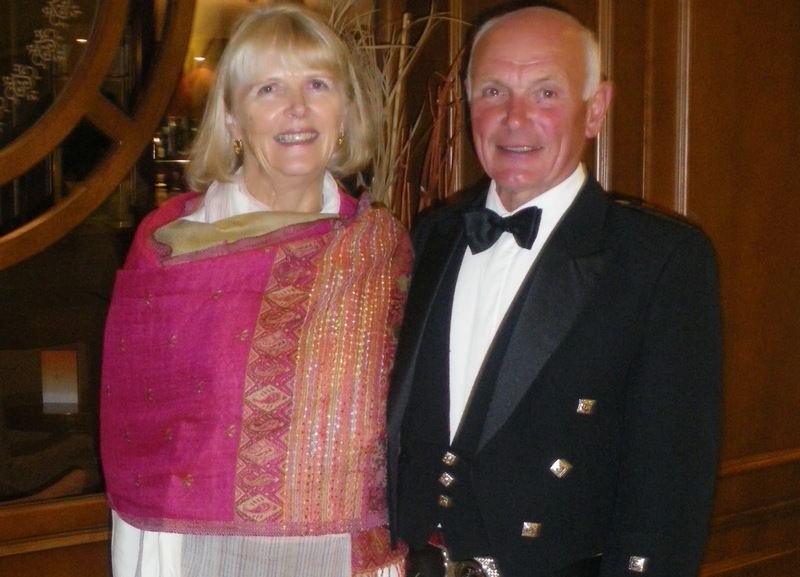 Ross and Sara now live in Cyprus, and are friends and neighbours of Giles and Val Day, who will be well known to many mineral processors who worked in Chingola in the early 70s. Relentless! 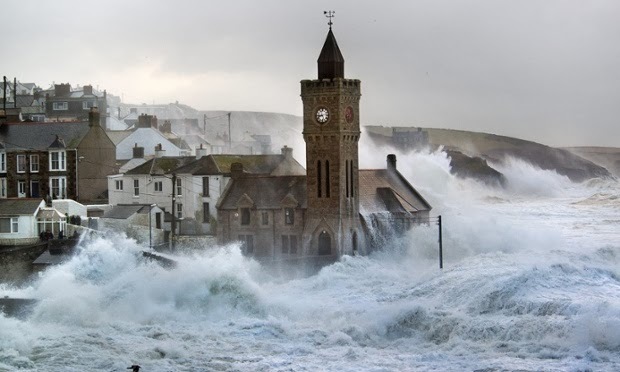 Is there any end to this 'conveyor belt of storms' that is causing chaos in the UK? 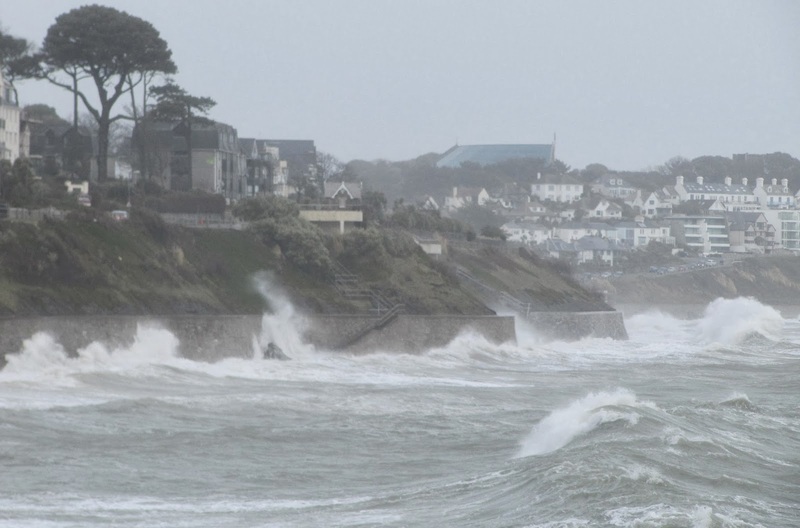 This afternoon's storm was the biggest to hit Falmouth, and never in my 40 years here have I seen a sea as big on this stretch of coast. The photos below I took an hour ago on the MEI Conferences walking route, and this YouTube video, taken from the window of the MEI office, gives some idea of the strength of the wind. All around the world there are extreme weather conditions at the moment, so let us know how you are fairing, no matter where you are. In opening Biohydromet '12, MEI Consultant Dr. Chris Bryan, of the University of Exeter, spoke about the history of biohydrometallurgy, from the ideology of the early 80's, where it was going to revolutionise mining and replace pyrometallurgy completely, to the abrupt dose of reality in Corale Brierley's IBS 2005 keynote address "we need to wake up to the fact that this is, and only ever will be, a niche technology", and the need for pragmatism. Chris remarked that biohydrometallurgy has a poor reputation in certain circles, as a technology that is too unpredictable, but he highlighted that it is often used as an avenue of last resort on ores that are untreatable with other methods. Biohydromet '14 is something to look forward to as it comes at a time when rapid advances in our understanding of the science of microorganisms may in effect have awoken biohydrometallurgy from its long slumber, and it now looks as though it might start to realise its true potential and provide real benefits to the minerals industry. A glance at the timetable for June's meeting confirms this view. Biohydrometallurgy's greatest success has been in the treatment of refractory gold ores, the first industrial scale plant being started at the Fairview Mine at Barberton, South Africa, in 1986. Since then, biooxidation operations have been commissioned in a number of countries, such as Australia, Brazil, Ghana, Peru, China, Uganda, USA, Kazakhstan, Uzbekistan and Russia. A number of commercial bioreactor processes have been developed, such as BIOX®, which will feature on the 3rd morning of Biohydromet '14. Researchers at Australia's highly esteemed CSIRO will be presenting three papers at Biohydromet '14 and one of the authors, Dr. Anna Kaksonen has co-authored an excellent review on the role of microorganisms in gold processing and recovery, which has recently been published in Hydrometallurgy. The paper shows how several microbial processes are relevant for gold leaching and recovery. Some of these may be applicable for in situ or in place leaching of low grade gold ores, which the industry will increasingly depend on into the future. Other microbial processes need to be considered as potential risks for lixiviant stability and gold recovery. The understanding of these processes will enhance future industrial applications of biotechnology and lixiviant use by the minerals industry. Giant Finnish company Outotec is a sponsor of two of MEI's upcoming major conferences, Comminution '14 and Flotation '15, but also, and perhaps more appropriately, Sustainability through Resource Conservation and Recycling (SRCR '14), as the company has been ranked 3rd on the Global 100 list of the world's most sustainable companies. The annual listing was announced at the World Economic Forum in Davos, Switzerland last month. This was the second consecutive year Outotec was included in the index (ranking 12th in 2013). Congratulations Outotec, MEI is proud to be associated with you, not only for your sustainability record, but also for your recognition of outstanding young people in our industry. 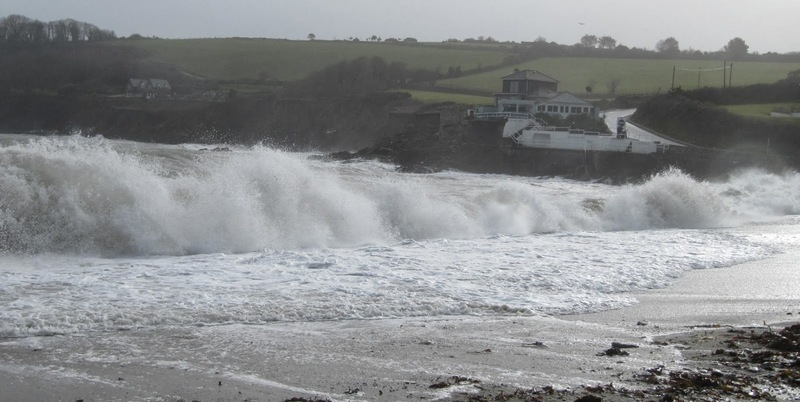 A report this week from the UK Met Office warns that the "conveyor belt" of storms which has battered us since early December is likely to last for at least the next few weeks. 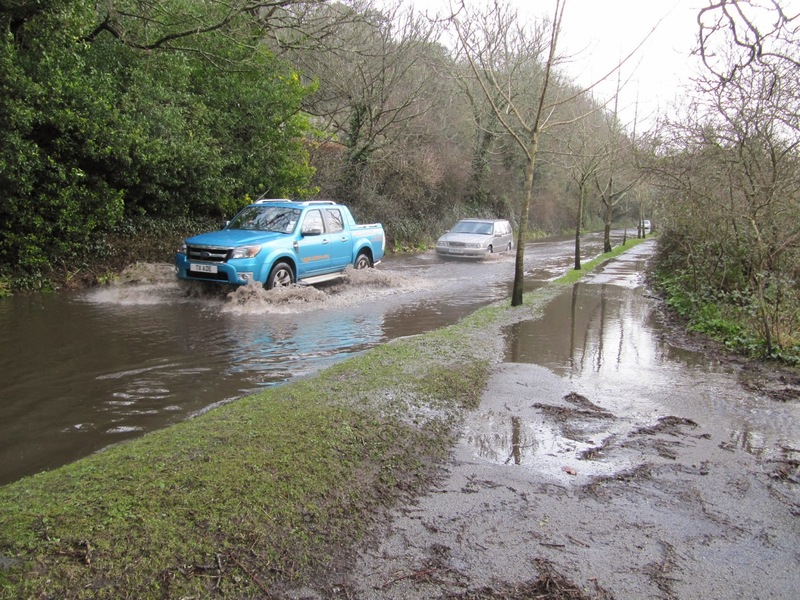 It suggests that the UK's floods and storms are just one element of a global disruption of weather patterns, the origin of which lies thousands of miles away in the tropical Pacific. According to the report, the changes are consistent with climate change. Climate change science, and in particular government policies determined by scientific reports, are of great importance to the minerals industry, a major consumer of energy and producer of CO2. It is interesting to read the intense debate which took place on this blog over three years ago, the overwhelming consensus among the many minerals industry correspondents being that if humans are contributing to climate change, the extent to which they are contributing is open to much doubt and debate. Since the recent Intergovernmental Panel on Climate Change (IPCC) report the media are again reporting that all scientists agree that climate change is taking place and that there is little doubt that human action is the main contributor via CO2 emissions. I wonder if the correspondents of 3 years ago now fall into line with these views? Personally I don't want to get embroiled in the debate between climate change believers and deniers again. There appears to be little doubt that climate change is now taking place, and that humans are playing some part in this, but to what extent is still open to debate. My scepticism has always been about the reliability of models describing this immensely complex system and the IPCC report also casts some doubt on the models and their predictions of what will happen by the end of the century. 1. It is said that the average temperature of the atmosphere has risen by 1.5 C over the last 100 years. How do we know this? There must be sophisticated methods of measuring the temperature now, but how was average temperature measured 100 years ago? 2. Apparently the CO2 level is now around 400ppm. Is this a global average or is this a uniform figure ie is the CO2 level in the UK the same as that in India and of that over the centre of the Pacific? If it is not uniform is it reliable to compare levels now with levels inferred from CO2 trapped only in Antarctic ice? And would CO2 in this air be dissolved into the ice with time, thus giving falsely low readings? 3. If a country is told to cut its CO2 levels by X%, how does anyone know if they have done this or not? How are a country's emissions measured (or calculated)? 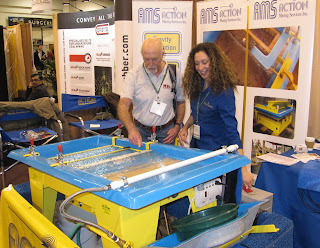 In two weeks time I will be in Salt Lake City, Utah, for the American Society of Mining Engineers (SME) Annual Meeting. 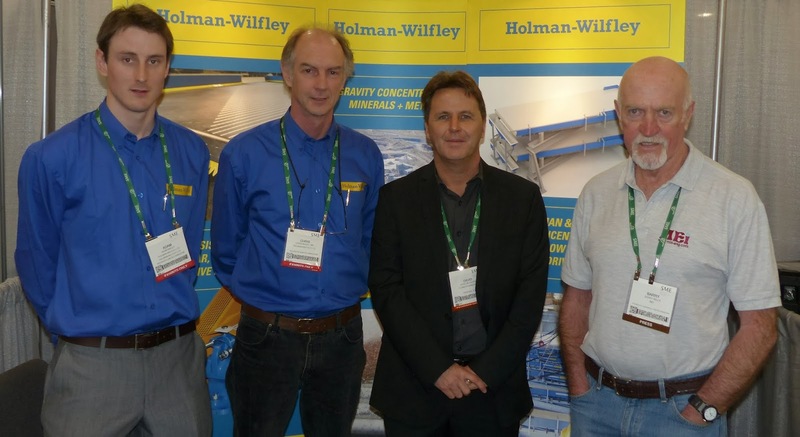 This is one of the industry's great networking events, the attendance last year being around 7000 delegates. MEI is, as always, a media partner and I shall be spending much of my time in the giant exhibition (585 booths last year), looking for interesting news of people and innovations and photographing proceedings for the MEI report. I am also looking forward to hearing Dr. Osvaldo Bascur, of OSIsoft, USA, present the prestigious Antoine Gaudin Memorial Lecture. So if you are attending, and have any interesting mineral processing news that you would like to share, look out for me at the event (wearing my shirt with the distinctive MEI logo) or contact me before the event to arrange a suitable meeting time. The 19th century Crown Mines, perched on the granite cliffs at Botallack near Land's End, are the county's most photographed engine houses. There must be thousands of photos of these ruins but probably none as dramatic as this one, taken by Peter Hulance, and posted on Facebook. 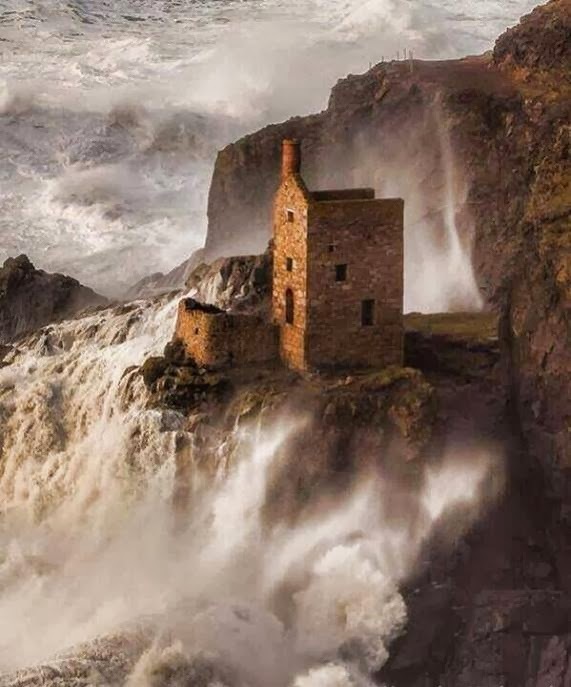 This is the bigger of the two engine houses, the pumping house, totally at the mercy of the Atlantic storms which are still sweeping through Cornwall. 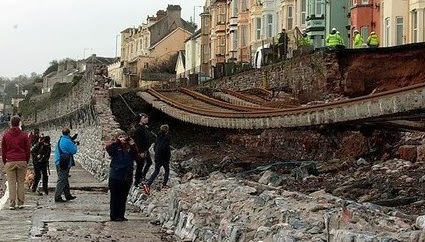 Meanwhile in Devon, work has commenced on repairing the break in the Great Western rail line between London and Penzance. It is expected to take at least 6 weeks, and in the meantime rail travellers are being bused between Exeter and Plymouth, where they resume their train journey into Cornwall. 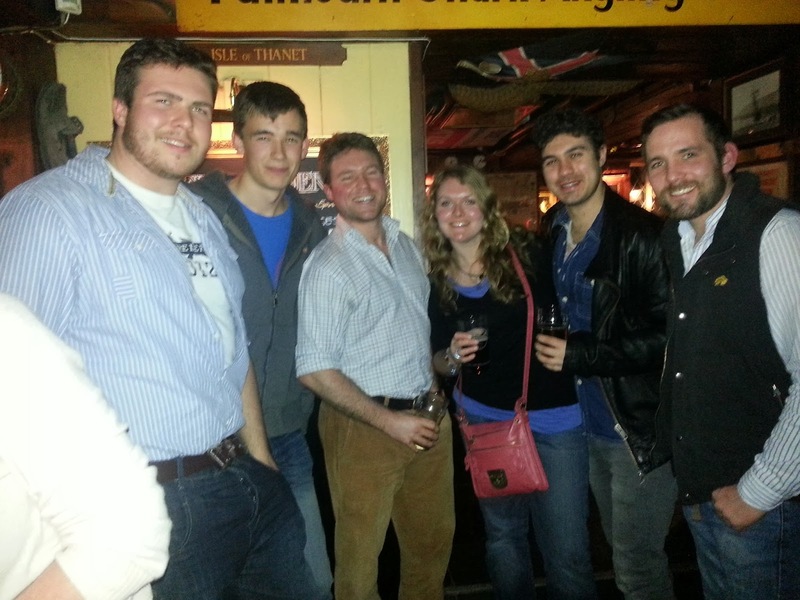 Hopefully all will be back to normal in June for Biohydromet '14 and SRCR '14 in Falmouth.